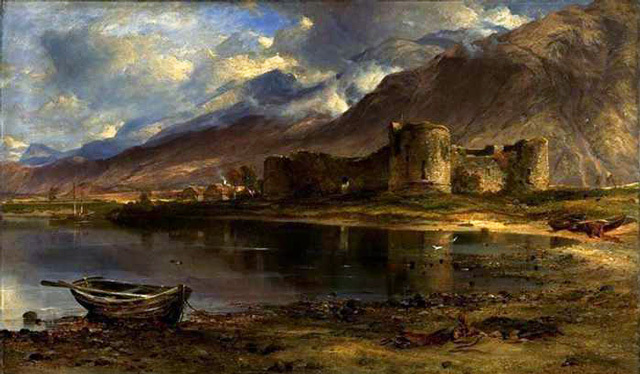 Notes: Inverlochy Castle is a ruined, 13th century castle near Inverlochy and Fort William, Highland, Scotland. The site of two battles, the castle remains largely unchanged since its construction. It is now in the care of Historic Scotland. Inverlochy is now a ruin, but is unusual because it has remained unaltered since it was built in the reign of King Alexander III. The castle is sited on the south bank of the River Lochy, at the strategically important entrance to the Great Glen, a key passage through the Scottish Highlands. With one side defended by the river, the castle's other three sides were originally protected by a water-filled ditch. Inverlochy is a castle of enceinte, with its main defence being a substantial curtain wall. The simple layout comprises a quadrangular courtyard, 31 by 27 metres (102 by 89 ft) across, surrounded by a wall up to 2.7 metres (8.9 ft) thick and up to 7.6 metres (25 ft) high, with round towers at each corner. The largest of these, known as the Comyn Tower, is 6.1 metres (20 ft) across the interior, and served as the castle's "donjon", or keep. The smaller towers are 14 feet (4.3 m), and all four have stairways curving up within the thickness of the walls. The main entrance was to the south, with a "water gate" facing the river to the north. Both entrances were defended by a portcullis, and the south door may have had an interior gatehouse.